ASCL Annual Conference was a chance to take stock of what we do in our schools and colleges, and opened our eyes to fantastic learning and networking opportunities, says Headteacher Theo Nickson. It was at the end of one of our SLT meetings last autumn that I suggested that it would be a good idea for the whole team to attend the conference. I explained that to build the strong teams we need to run our schools and colleges, we need to invest the time and money, we need to take stock of what we do and we need to open our eyes to the learning and networking opportunities the conference gives us. So, six months later (March), four of us descended on Birmingham for two days of inspiring and stimulating activities. The dynamic opening, featuring film footage of pupils from ASCL President, Carl Ward’s City Learning Trust, set the mood of Conference and grounded us to the very reason we were there – our passion to do the best for the children in our school now and in the future. Carl’s speech reflected on his personal background and the invaluable role his own education has played in his life – something that resonated with me and my team. He spoke of the pace of change in our society, whether it be government policy, curriculum or technological advances, and emphasised the need for stability, breaking free from the present short-term cycle of educational policy to embrace the need for long-term planning for the future. Lucy Powell MP followed Carl and discussed the pressures that leaders are under to resolve the conflict between acting in the best interests of our children or the best interests of our school or college, for example, when making decisions about funding. She urged leaders not to underestimate our political power and to strive to influence government on the issues that matter to us. Next on the podium was Professor John Hattie. I’m sure many leaders hearing his speech were conducting a virtual learning walk around their schools, contemplating what students see in the classroom and how it compares with the teacher’s point of view. Many will have been reflecting on the expertise in their workforce and how efficiently, or not, it is being used. Professor Hattie’s explanation of how some Australian states are developing professional standards for teachers, irrespective of the number of years’ experience, had us thinking about how we nurture young talent and retain our best teachers in the profession. There was an echo of this in General Secretary Geoff Barton’s speech to Conference on day two, when he said he wished he’d run an assembly featuring a panel of staff, from bright-eyed newly qualified teachers (NQTs) to staffroom veterans, to showcase what a brilliant profession teaching is – we don’t sing our praises enough. Astronaut Tim Peake’s speech and film footage of his time in the space station concluded the morning and reminded us of the bigger perspective. I was particularly struck by the images of Earth in daylight, which showed just physical formations and no sign of life. The same face at night, with the patterns of human-made light, showed intellect and imagination at work, showed science and technology shaping our world. An emerging question throughout Conference was the extent to which the growing capability of technology and artificial intelligence (AI) will have a profound effect on our society and the wider world. The Confederation of British Industry (CBI) President Paul Drechsler’s speech expanded this notion further with the suggestion that the business world needs schools and colleges to succeed so children are prepared for working in organisations where automation will dominate. He reinforced the need for stability in our education system, so that effective collaborative relationships could be established between educational leaders and businesses, emphasising that quality interactions between employers and students while still in school would result in less likelihood of unemployment. 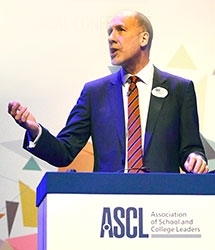 On day two, ASCL General Secretary Geoff Barton, not yet a year into the role, commanded the stage as he spoke with conviction of how we must challenge the culture of compliance that currently exists in education by taking the lead and exerting our influence. He encouraged us to be restless on behalf of future generations, to improve routes into teaching, put pedagogy at the heart of what we do and not be hounded by management systems and accountability. My colleagues applauded Geoff with vigour, recognising that what he was promoting was the need for us to shift the focus back to what matters the most – the children. Damian Hinds, barely two months into the role of Secretary of State, promised to address the issue of workload and acknowledged the burden that government and Ofsted impose on us through the fast pace of change. We were, however, left struggling to comprehend how exactly he was going to do this. It was appreciated that HMCI Amanda Spielman accepted accountability pressures may have diminished curriculum breadth, which she stated must be put first. She also emphasised that the Ofsted framework is clear about expectations and that much work was done to dispel the myths surrounding Ofsted. It was refreshing to hear that leaders should challenge inspectors who require more than what is in the framework. Following the speeches, Geoff led a panel discussion with Damian Hinds and Amanda Spielman. It was good to see two of the most powerful people in education sitting down with our General Secretary to have a discussion about how, together, they can shape the education life-chances of children and the professional lives of teachers. The breakout sessions across both days provided us with opportunities to hear from ASCL specialists, leading educational researchers and fellow colleagues. Choosing which sessions to go to is always a dilemma, and a significant benefit of being at conference with my SLT meant we could attend a broad range of sessions and share our findings afterwards; there was something for everyone and there is no doubt that the two days will influence decision-making back at school. My diary already has 15–16 March 2019 highlighted for next year – I look forward to discovering whether promises made will be kept; I know that my needs as a school leader will be met. Carl’s speech reflected on his personal background and the invaluable role his own education has played in his life – something that resonated with me and my team. Headteacher of Bishop’s Hatfield Girls’ School in Hertfordshire.